...ask the people around you about their lives — it could be your grandmother, a teacher, or someone from the neighborhood. By listening to their stories, you will be telling them that they matter and they won’t ever be forgotten. It may be the most meaningful time you spend this year. National Public Radio has had many of its radio personalities record conversations with the people in their lives. For an idea of the kind of conversations they had, you can listen here. I posted about the StoryCorps project last year, click here if you missed it. 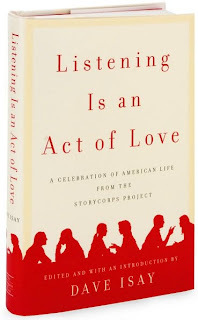 We own Listening is an Act of Love: A Celebration of American Life from the StoryCorps Project [973.92 LIS], a collection of stories that will make you laugh, and cry, and generally feel good! And, who doesn't want to feel good? Rather than the purchase of a sweater or a Blackberry, the gift of listening, and time spent, may be the most meaningful gift of all! 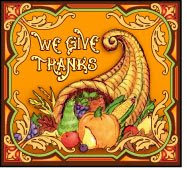 Peace to all this Thanksgiving! KK is taking the rest of the week off. See you on Monday. Only two more days and it's Thanksgiving. If you're serving up the dinner, what are going to do with the kids while you prepare? We have plenty of books and films to occupy the kids, but perhaps they'd like to help. What can you give them to do? Help set the table for one. Help decorate it for another. The Toymaker has a page of items that can be printed off and decorated or assembled by your kids. Most require nothing more than the child cutting and folding. 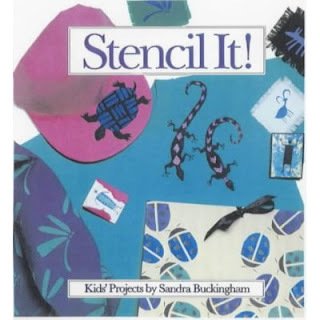 And most, can be printed off in a black and white version that allows children to color the items, too. If you've never visited The Toymaker site, make sure you do so. Her items are clever and quite beautiful! While everyone is hard at work, play Marlo Thomas's CD, Thanks and Giving All Year Long [CD CHILDREN THO] and listen to a stellar group of performers sing or read. You'll hear the likes of Sheryl Crow, Jimmy Buffett, Kermit the Frog, and Amy Grant, among others. It was not that long ago that the last little public library in NH finally got a bathroom. Come to find out, though, there was still a library in VT without the modern convenience! Read all about it here! I've always thought that if I were on the road and had to go, I could depend on a public library to serve my needs. Boy, was I wrong! 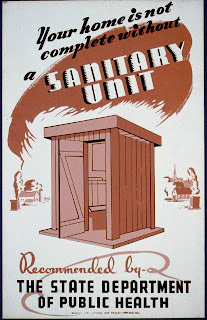 How's your bathroom doing? I'm sure you have one, but is it looking a little worse for the wear? Time for a little redecorating? Have we got books for you! Once you've finished your makeover project, take a nice, long, hot bath and relax your tired muscles. Borrow Mary Muryn's Water Magic: Healing Bath Recipes for the Body, Spirit, and Soul [615.853 MUR] and enjoy a therapeutic soak. Poetry Friday--Everyone Knows This One! Lydia Maria Child was born practically next door in Medford, MA. She was an extraordinarily accomplished woman as you can read for yourself in a biographical piece at the Poetry Foundation. Child is nearly forgotten today except for a little poem she wrote that was later set to music, "A Boy's Thanksgiving Day." 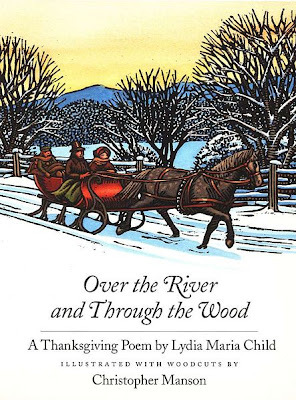 It is more commonly known by its first line, "Over the river and through the wood." And yes, I'll accept the blame for the earworm that's going to be with you all day! We have several illustrated versions of the poem/song in our children's room and it appears in numerous poetry anthologies, so browse the poetry shelves. Child's work is also represented in recipes adapted from her book, The American Frugal Housewife (1829) that appear in Old Sturbridge Village Cookbook: Authentic Early American Recipes for the Modern Kitchen [641.5 OLD]. Do you belong to a book club? If so, you may want to look into the READS-TO-GO book kit program. R-T-G is a program of the Reference and Adult Services section of NH Library Association. A kit includes a canvas bag packed with 15 copies of a highly discussable book. And, if you can't think of anything to discuss, there are discussion questions included. Kits are borrowed for a period of approximately 2 months. The slideshow above is less than half of the titles available. For more information, check out the READS-TO-GO webpage. And, when you're ready to borrow a kit, ask our reference librarian, Lois, to help you reserve one! 4. the Rapture, Theology. the experience, anticipated by some fundamentalist Christians, of meeting Christ midway in the air upon his return to earth. I suppose I should be up on these things, but, after the time about 10 years or so ago, when every telephone pole in town was plastered with signs warning about the upcoming Rapture, which never happened, I guess I've dismissed talk of the Rapture. Rapture prediction is now a full time occupation for some, and one of the people interviewed for the above-named Newsweek article, states that followers of today's Rapture movement, "are expressing a concern and a fear that is widely shared." Another less drastic view of the Rapture is outlined in Barbara R. Rossing's book, The Rapture Exposed: The Message of Hope in the Book of Revelation [236.9 ROS]. The novelists, Tim F. LaHaye and Jerry B. Jenkins, have written an epic series on the Rapture called "Left Behind" [F LAH, also in AB/CD LAH]. If you haven't signed your younger kids up for the Friends of the Library of Windham's (FLOW) annual crafts workshops, head on down to the library lickety-split before all the spaces are filled. The items are viewable in our display case and making them should make every little crafter proud! 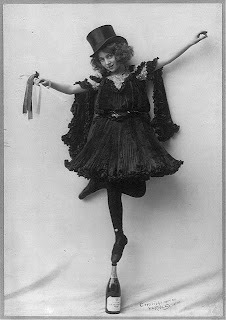 Llimos, Anna. Easy Bead Crafts in 5 Steps. [J 745.582 LLI] "Bookmark" pp. 10-11. Martin, Laura C. Recycled Crafts Box: Sock Puppets, Cardboard Castles, Bottle Bugs, and 37 More Earth-Friendly Projects and Activities You Can Create. [J 363.72 MAR] "Rag Coasters and Bowls" pp. 75-77. Did you know that last Thursday (11/13) was Guinness World Records Day? I didn't! But, I did hear about it after it was over and I'm happy to report that many records were broken that day including one for most full beer steins carried by one person! Of course the record breaker was a German barmaid! She carried 19! You can watch the feat on the BBC website. Here's another that I don't think I would have participated in myself--"Largest Gathering of People Wearing Underpants/Knickers"
The world record for the largest gathering of people wearing underpants/knickers is 116 achieved by the fair trade organization "Pants to Poverty" at St. Pancras International train station, London, UK on 13 of November 2008 in celebrations of Guinness World Records Day. Finally, here's one that I think we should attempt here in Windham--"Most Adults Reading to Children." The record was broken in Dubai with 3,032. I'll bet we could break the record, too! To read up on last year's winners, borrow Guinness World Records 2009 [031 GUI or J 031 GUI]. It's fun reading! Or, check out the website. Poets.org is a site from the Academy of American Poets and is not to be missed if you want to experience poetry. On the site are not only poems, but also audios and videos of poets reading their work, or the work of others. I'd like to share the work of Ron Padgett today. His poem, "Rialto," can be both read and listened to. I love the poem because it reminds me of the old movie theatre in the town where I grew up. The Regent Theater in Bay Shore, NY, 1915--way before my time! To read the whole thing or to listen to it read aloud, click here. Thanks for the memories, Mr. Padgett! 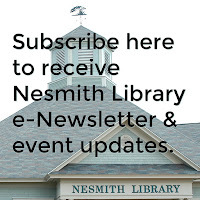 Continuing with the idea of making your own holiday gifts of "beauty," the Nesmith Library has a goodly number of soap making books. If you've been to craft fairs over the past 10 years, you've noticed an increase in the number of handmade soap vendors. Why pay an arm and a leg for a bar of soap simply because it is labeled "handmade"--you can make the soap yourself! Customize it with a label or wrapper that personally relates to the recipient and you've got a thoughtful and unique holiday gift! In the olden days making soap involved melting down pounds of animal fat and adding an extremely dangerous ingredient--lye. In the older olden days, you first had to make the lye by processing wood ashes! But luckily, we're in an era when making soaps has become a whole lot easier! Working with lye may still be part of the process in some recipes, but, with detailed instructions and cautions, it has become safer. And, with the availability of essential oils, the soaps smell a whole lot better! 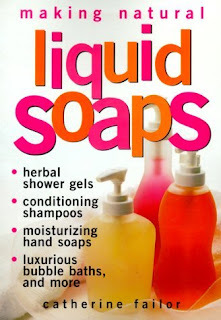 A website called Teach Soap covers many aspects of soapmaking and is a good place to explore before getting started. If you want to make soap the old-fashioned way, simple instructions are on this page. With the economy in the state it's in, you may be thinking about a smaller-scale holiday season this year. One way to achieve that goal is to make your own gifts. I've highlighted many of our fiber-arts books over the past two years in posts on knitting--"Keep Your Mind Occupied While Your Fingers Are Flying," "Busy Fingers," and crocheting--"Crochet--It's Not Just Doilies Anymore." 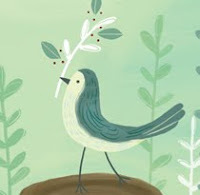 I've told you where to find books on building a birdhouse or feeder--"The Sounds of Spring," or making musical instruments--"Make Your Own Music." There are any number of things you can make as gifts--a fun project, especially for women and teen girls, is making your own beauty products. We can help you accomplish this! 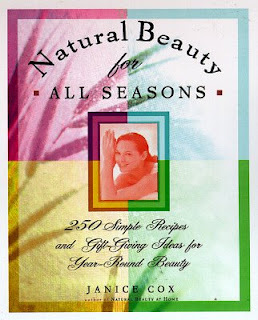 Natural Beauty for All Seasons: 250 Simple Recipes and Gift-Giving Ideas for Year-Round Beauty by Janice Cox [646.72 COX] is a great place to start. Cox covers everything from growing your own loofahs, to making and potting masks, lip gloss, and massage oils. She also includes patterns for making special envelops for bath salts and powders. I'll be looking at other make-it-yourself gift ideas over the next few weeks. If you get started now, you'll be sure to have everything ready in plenty of time! Veteran's Day originally was known as Armistice Day since it commemorated the end of the Great War (now known as World War I). Today is the 90th anniversary of the day the Great War ended. It happened on the eleventh hour of the eleventh day of the eleventh month of 1918. The library is closed today in honor of our veterans. I wish you peace. I guess this is going to be sea week, since yesterday I wrote about waves, and today I'm covering sea life! since 2000, the initiative-—executed by boat, tags, nets and submarine--has uncovered more than 5,300 new species, as diverse as blind lobsters and sulfur-eating bacteria. Isn't that amazing--10 years ago there were 5,000+ species living under water that we didn't even know about! Who said space is the final frontier? On a recent trip to Washington D.C.'s National Museum of Natural History run by the Smithsonian, I was in awe of the Sant Ocean Hall. The photos and videos displayed were absolutely gorgeous. I've ordered the companion book to the Sant Hall exhibit, Smithsonian Ocean: Our Water, Our World by Deborah Cramer. It was released only two months ago, so it is full of up-to-date information. Look for Cramer's other book, this one on the Atlantic Ocean--Great Waters: An Atlantic Passage [551.46 CRA]. 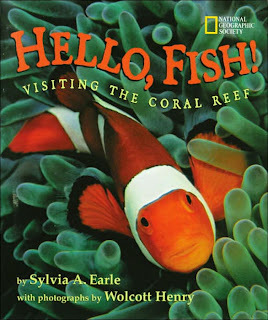 We have a number of books on fish including The Encyclopedia of Fishes [597 ENC] in the adult room, and Hello Fish, Visiting the Coral Reef by Sylvia A. Earle [J 597 EAR] children's. Well, I've planted an ear worm by titling this post, "Under the Sea." I'll have to borrow The Little Mermaid [J DVD LIT] and sing along with Sebastian tonight! When I was a kid, I read a book by Pearl Buck called The Big Wave. 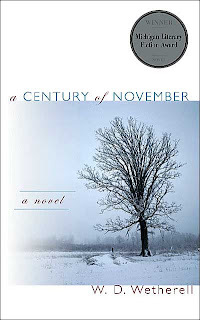 It was a fairly short book that told the story of a tidal wave and its effect on the people of a Japanese village. I was surprised to find that The Big Wave is still in print. It was originally published in 1948. 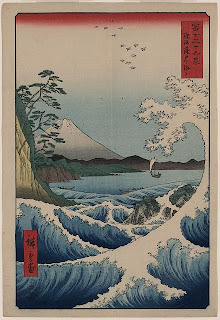 The original version used the prints of Hiroshige and Hokusai, such as you see above. The reason I bring this all up, is I was reminded of the book by an article in the Boston Globe. The mystery waves in the article aren't tidal waves (now more commonly known as a tsunamis), but they might be rogue waves. "Rogue wave" is a term I hadn't heard before. Here's an explanation. You can learn more about large waves in either of these books by Ellen J. Prager, Furious Earth: The Science and Nature of Earthquakes, Volcanoes, and Tsunamis [551.2 PRA], or, The Oceans [551.46 PRA]. The poet, Hayden Carruth, passed away a few weeks ago. He was 77 years of age and had lived for a time in nearby Vermont. You'll find a brief bio of Carruth here. His work may be found in several of our anthologies including After Frost: An Anthology of Poetry from New England [811.08 AFT], The Body Electric: America's Best Poetry from The American Poetry Review [811 BOD], and Good Poems: Selected and Introduced by Garrison Keillor [811.008 GOO]. 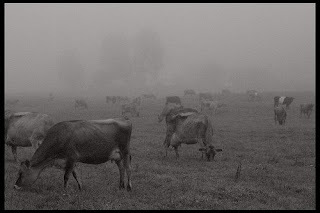 Here's a taste of Carruth from "The Cows at Night"
there's more to it, and you can find it in The Body Electric. It's a day to celebrate! 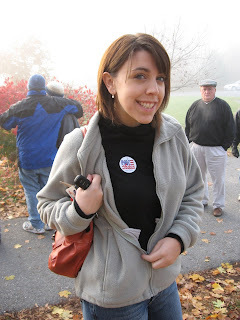 It was two years ago, November 6, 2006, that Kurious Kitty's first post appeared! It wasn't more than a line or two, but I had just managed to set up the site and was still getting used to the idea of blogging regularly. Now, I seem to be able to do a post in my sleep! I've posted at least twice on Spam--not the unwanted emails, but the meat-in-a-can. Several times on haiku. And more times than I care to think about on baseball, including one about Red Sox coffins! If you have some topic you'd like me to explore in a post, please use the comments function. I rarely receive comments! It makes me feel unread! I'll tie up this part of today's post with the mention of a new book on blogging. I'll include it as a kind of threat--comment on my blog or I'll read this book! Problogger: Secrets for Blogging Your Way to a Six-Figure Income by Darren Rowse [006.7 ROW]. I like blogging for the library, but when someone waves a 6-figure income in front of me, I have to weigh my options carefully! You may have heard about a national holiday being celebrated today in Kenya. If not, here's an NPR piece on Barack Obama's father's ancestral home and the way the Kenyans are rejoicing in the news of our new president. To learn more about Barack Obama and his father, look for Dreams from My Father: A Story of Race and Inheritance [B OBA also available in AB/CD B OBA]. Have a great day! Eat a piece of cake for me, and, President Obama! We have a new president! Let's join in wishing Barack Obama the best of luck over the next four years. The thing about history is, it is always being made! That's why a book like Presidents FYI [J 973.09 PRE] is out-of-date as of this morning! It was published June 1st of 2008! 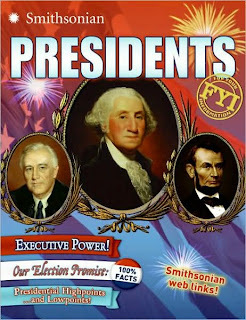 Of course, the information on the former presidents is still valid, but for us to be current, we'll have to start looking for a newer edition! Continuing with the subject of presidential history, I'd like to recommend A Magnificent Catastrophe: The Tumultuous Election of 1800, America's First Presidential Campaign, by Edward J. Larson [324.973 LAR]. This recent addition to our election history section only goes to prove that although it is always changing, history is also always subject to re-evaluation and study. The most important thing you can do today is to vote! You have the power--use it! My daughter and I were at our polling station at 7:00 am and we had stood in line, voted, and were out by 7:25--with a sticker to prove it! 1. How America votes : law, process, and voter participation -- v. 2. What influences the American voter : interest groups, issues, and the media -- v. 3. American voting systems in flux : debacles, dangers, and brave new designs. Celebrate your right to vote and get out there and VOTE! My favorite stress reliever is to take a little time and visit the icanhascheezburger site. One more day until the presidential election is over. By Wednesday, I hope to be completely stress free. Until then I needz cheezburger!